Rags to riches a success story of Rakesh Jhunjhunwala is truly inspirational. Big Bull Rakesh Jhunjhunwala Indian Warren buffet and king of Dalal Street has made a fortune of $3.1 Billion from small investment capital of Rs.5000. Rakesh Jhunjhunwala is a common man with uncommon intelligence. Making money from the stock market is like child’s play for Jhunjhunwala. Rakesh Jhunjhunwala is qualified charted accountant and stock market Investor. He manages his own stock portfolio as a partner in asset management firm, Rare Enterprise. You must be wondering that how Rakesh Jhunjhunwala has done it. Well here is a success story of investment guru big bull, Rakesh Jhunjhunwala. Rakesh Jhunjhunwala was born in Mumbai on 5th July, 1960. He was born in the middle-class family. His father was Income tax officer and stock market investor. From childhood days Rakesh Jhunjhunwala had thought to become a pilot and later stage he wanted to become a journalist. However, from beginning, he was introduced to the world of the stock market by his father. He used to listen a lot of stock market jargon from his father. His intuition of learning stock market was increasing day by day. Once he asked his father that, what is the reason for fluctuations in the stock price? He got a simple answer that price fluctuation is linked to news flow. This was his first learning for the stock market. He started reading a stock market column in the newspaper with fascination. During the initial stage of life, he decided to make a career in the stock market. Before entering into the stock market, he completed his graduation in commerce from Sydenham College. After commerce graduation, he enrolled at himself in ICA and became a Chartered accountant in 1984. After completion of CA, he expressed his wish to become a stock market investor to his father. This type of move was unorthodox and unacceptable to most of the people, but his father was democratic, he reacted differently by telling him that he can start a career in the stock market, however, he would not support him financially in this endeavor. He further advise him that never take any shortcuts and never forget that “Your word is your bonding”. 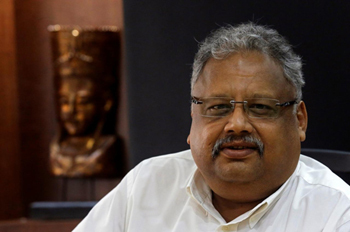 Rakesh Jhunjhunwala started stock market investment in the year 1985. He started his career with the small capital of 5000 Rs/- At that time BSE Sensex was at level 150. He was knowing that such small capital will not help him in the stock market. In order to get capital, Rakesh Junjhunwala approached his brother and was able to raise capital of 1.5 million. With this capital, in a short span of 1 year, he earned nearly 1 million and invested this profit in 5,000 shares of Tata Power. He realized that trading is only option for him to earn big money from stock market. He started trading in stocks. He purchased Sesa Goa and Telco Stock. These stocks had generated good return for him. He was doing trading extensively and trading gave him all the money required to make an investment. His every small moves was making him wealthy. The first and last principal of trading as per Rakesh Jhunjhunwala is “Trading is price based trend and not opinion based”. This means that if you buy stock at Rs 100, and then the price falls to Rs 95 you can take your loss and square off your trade. This is one common quality of successful traders. In trading you should remember Churchill’s words, ‘You have to lose many a battle to win the War’. Along with that one should also remember word of George Soros, “It’s not important whether you are right or wrong, it more important how much you lose when you are wrong and how much money you make when you are right”. This requires you to square unfavorable trade, and to pyramid your profitable ones. In trading, everything else is illusion and hope, the sole reality being a price. Never aspire to be the market’s master. It’s best to be its slave. As per Rakesh Jhunjhunwala to be successful in investing, many elements have to fall into place. But four things are critical. Management should be of high quality and integrity. I hope inspiring success story of Rakesh Jhunjhunwala will help to get succeeded in the stock market. Do share your views on the success story of Rakesh Jhunjhunwala! « How to earn passive Income?